Azure Management and Governance is hard because Azure services are growing at a fast pace. Try to imagine that you are a Azure Administrator for a large company and that you need to maintain the Azure Subscription. If you start thinking about it sounds really hard and that makes you wonder about options that you have to manage and keep it running as it should be. Role Based Access Control is a huge one here. This was in place since the beginning of the new Azure Portal. This made sure you did not have to make someone Co-Administrator on your complete subscription. Besides the build-in options there is also a need to define a policy regarding your Azure Environment also called a Governance document. In the document you need to specify naming conventions that are used for creating and naming of services. The options described above can help you maintain that Governance. Azure Policies and Audits help you manage risks within your Azure Environment / Subscription. Therefore it will help you by restricting, enforcing or auditing events. It is a default allow system. By default everything is allowed. You will need to define deny or audit actions. Policies are created by Policy definitions, which are if-then conditions. Deployed and Maintained via the Resource Manager. Deny: Stop / Cancel the request. Audit: Add a specific message to the Audit log. Append: Add information to the resource. For example add a specific tag. Alongside the policies you also have the activity (audit) log that gives insight in all activities in and around Azure. CanNotDelete: You will not be able to delete the resources with this lock applied. ReadOnly: You only be able to read the resources with this lock applied, and will not be able to edit specific properties. With a Resource Lock applied you can make sure someone does not accidently delete a business critical application, or for example the virtual network with the connection to the on-premise systems. 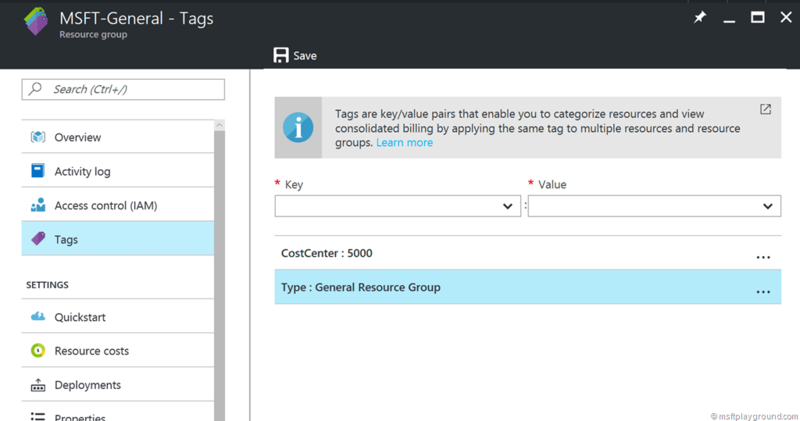 In my opinion you should always tag your resources groups with useful information and tag the resources within with the tags that are appropriate. A Resource group is a logical container for resources. You can resources by project or application for example. Assign rights for the resource group. Because of the new model of Azure you can also assign rights within a Resource Group like Role-based access control to give access to resources. This service provides a way for people to automate the manual, long-running, error-prone, and frequently repeated tasks that are commonly performed in a enterprise environment. With Azure Automation you create so called Runbooks that are sets of tasks that are needed to be performed. You can use Runbooks created by the community within you Azure Environment. Start and run specific services. As Microsoft states Security Center helps you prevent, detect, and respond to threats with increased visibility into and control over the security of your Azure resources. 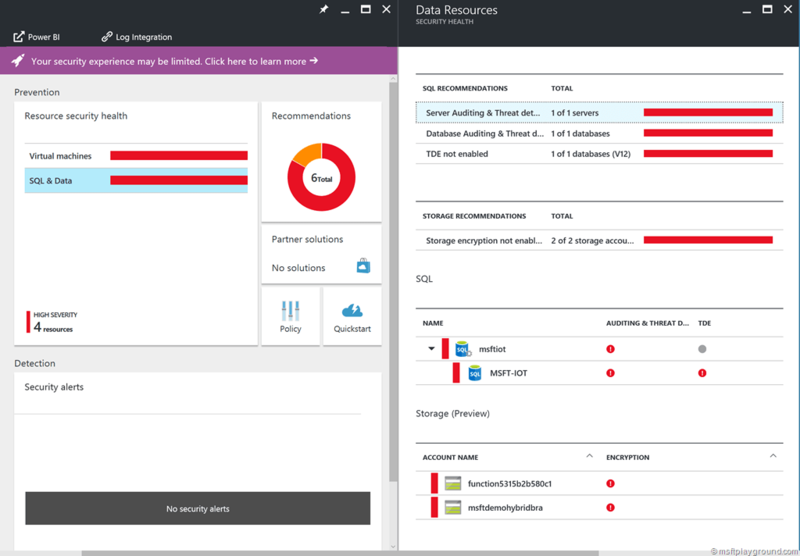 It provides integrated security monitoring and policy management across your Azure subscriptions, helps detect threats that might otherwise go unnoticed, and works with a broad ecosystem of security solutions. In the most simple form Azure Security Center is a service that gives you recommendation about the security of your services. Besides that it is also able to monitor the services in order to detect threats within your environment. Policies within Security center can be turned off when they are not seen as threats and based on specific settings you can also define alerts. Since last month “Azure Advisor” made it to public preview. The service is a recommendation engine that recommends steps to optimally configure your Azure resources. By analyzing the resource configuration and usage data it is able to make recommendations according to the best practices that in the long run will reduce costs and better the performance. You may noticed that the list also contains a Security category this category is a integration with Azure Security Center.